Just like water and fresh air, sunshine is a crucial ingredient to a healthy life. In fact, studies show that 10 to 20 minutes of sun per day helps people get their recommended daily dose of Vitamin D. But along with fun in the summer sun comes complications: sunburns, scrapes and the increased need to stay hydrated. 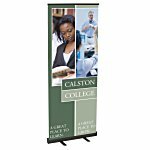 Offering summer promotional items can help customers and employees make the most of every sunny day. By giving safety promotional gifts, your brand can help make all their beach trips, hikes and sporting events a little safer. Accidents happen, whether it’s a skinned knee on a playground or small scratch while walking in the woods. When those minor injuries occur, your recipients will be happy you gave them safety promotional gifts, like one of these first-aid kits. The Sports First Aid Kit, contains bandages, sunscreen, ibuprofen and more, yet is small enough to fit in a pocket. For the animal lover, the Pet First Aid Kit is just what the veterinarian ordered, with gauze pads, antiseptic ointment, gloves and a first-aid guide for pets. 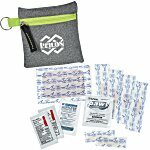 The Outdoor First Aid Kit is ideal for the hiker or camper. It has tweezers, poison ivy wipes, a sting stick, a 48-page emergency first-aid guide, and more. And the Primary Choice First Aid Kit is the perfect size to tuck into a desk drawer or glove compartment, with bandages, first aid creams and an antacid packet. It’s the ideal kit for handling common minor injuries. According to the CDC, everyone should use a minimum of an SPF 15 sunscreen every time they go outside. For the person heading out to the woods, Spray Sunscreen with Insect Repellent is especially convenient. This spray-on SPF 50 sunscreen and insect repellent will keep skin protected from the sun and bugs. The Sun and Aloe Pocket Pack is ideal for summer sports programs and outdoor festivals. There are pocket-sized sunscreen packets, and if they do get burned, there’s an aloe gel packet to help soothe. The Carabiner Sunscreen can be clipped to a purse or golf bag, ensuring that the recipient never forgets their SPF 30 sunscreen. And for complete summer skin protection, the Pro-Sport Sun Kit contains water-resistant SPF 30 sunscreen, SPF 15 Natural Lip Ice lip balm and After Sun moisturizer lotion with aloe vera and Vitamin E.
According to Mayo Clinic, men should consume 15.5 cups of water per day, while women should drink about 11.5 cups. Reusable water bottles make it easier to get the recommended amount of water, especially when they’re out and about. 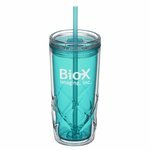 The Hydration Tumbler features double-wall construction to help maintain beverage temperature. It also has a bendable, capped straw and holds more than four cups of water. The Lil’ Shorty Aluminum Sport Bottle is more compact than the average water bottle and has a carabiner clip, making it easy to carry, or attach to a bag or purse. For a bottle with some neat extras, try the O2COOL® Prism Pop-up Top Mist and Sip Sport Bottle. It has a convenient carry loop, plus it releases a cool mist with the pull of a trigger. The Ozzy Tritan Audio Bottle is perfect to take while working out or relaxing by the pool. The screw-on lid contains a built-in light-up Bluetooth® speaker complete with a flashing LED light in the handle. While many people remember sunscreen during the summer, protection can come in many forms. Sunglasses and headgear are essential to keeping eyes healthy. The Neoprene Visor is a budget-conscious giveaway for a company picnic or nonprofit outdoor event. This soft, comfortable visor contours to the wearer’s head and keeps their face and eyes shaded. The Greg Norman® Performance Cap, with an adjustable strap and slide buckle lets the user find the perfect fit, while moisture-wicking technology keeps them cool and dry. Risky Business Sunglasses offer UV400 protection with a stylish look. And the Sunglasses with Bluetooth® Speaker allow the user to look sharp, protect their eyes and listen to their favorite music or podcast using Bluetooth technology. As people get outdoors during the long summer days, safety promotional gifts can keep minor bumps, bruises and sunburn from ruining the party. Whether you’re offering water bottles, sunscreen, sunglasses or a simple first-aid kit, these summer promotional items will help your employees and customers have the best (and safest!) summer ever. Find some great ideas for planning a summer picnic event! In this post you'll find some creative picnic invitations and promotions.